Dive into a dream world of adventures with Dream Raiders! Climb on board this beautifully modelled dream machine from Sega and be transported to a new level of excitement with full motion 4D thrills. Choose your dream ride and raid as many treasures as you can whilst fending off attacks by strange and incredible enemies with your Dream Blasters. The Dream Raiders arcade machine from Sega is a full motion 4D game that gives players a highly immersive and unique gaming experience. Successfully complete your raid and be carried off into new realms in thrilling bonus stages. Nine unique dream experiences await you in this fantastic new deluxe game from Sega. Ride a dragon, pilot a UFO, get on horseback or put on your super suits and head for the skies! Dream Raiders features an exciting mix of exhilarating experiences that everyone will enjoy. The combination of intense motion, wind, sound and visuals combine to give players everything they ever dreamed of! 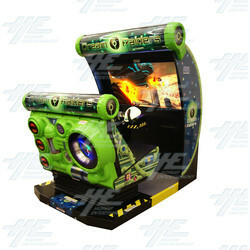 The Dream Raiders arcade machine from Sega is a full motion 4D game that gives players a highly immersive and unique gaming experience. Successfully complete your raid and be carried off into new realms in thrilling bonus stages. Nine unique dream experiences await you in this fantastic new deluxe game from Sega. Ride a dragon, pilot a UFO, get on horseback or put on your super suits and head for the skies! Dream Raiders features an exciting mix of exhilarating experiences that everyone will enjoy. The combination of intense motion, wind, sound and visuals combine to give players everything they ever dreamed of! This video is a trailer from Sega featuring the Dream Raiders 4D arcade machine. This popular full motion experience game has multiple levels of intense, immersive and unique gameplay that is sure to be a smash hit in any location.